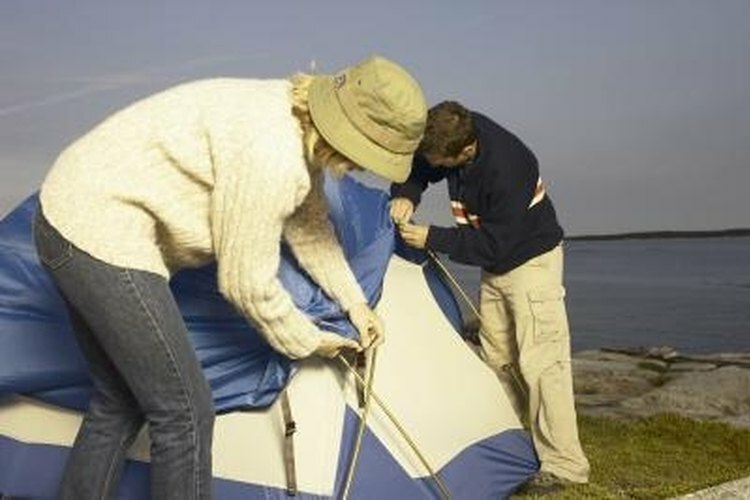 Keep your camping gear in good repair. Prone to tears and punctures, window screens are the most fragile part of the tent. While replacing the entire screen through the factory can be prohibitively expensive, you'll find that fixing small rips, tears and punctures is a simple and inexpensive repair. You need a little sewing skill and a little material to make a lasting high-quality repair. Trim loose pieces of the screen thread and weave with the scissors. Remove all loose threads and torn ends from the perimeter of the tear. Thread your needle with a small section of fishing line that is at least twice as long as the tear. Tie the free end of your fishing line to the untorn portion of the net screen at one end of the rip or tear. Use a double overhand knot to secure it. Pinch the torn edges of the rip together by hand and use the threaded needle to tightly sew the rip closed. Cut the line loose from the needle once the rip is sewn closed and tie the free end to the screen with a double overhand knot. Trim the loose pieces of screen around the edges of the hole or puncture with scissors. Cut a patch out of window screen material with your scissors. Ensure the patch is large enough to cover the entire hole or puncture, with approximately a half-inch of overlap to allow for sewing. Thread your needle with fishing line that is at least twice as long as the perimeter of the hole that needs to be patched. Follow the sewing instructions in Steps 3 to 5 from repairing small rips and tears to complete the large hole repair. When attaching a patch to repair a large hole or puncture, use adhesive to hold the patch in place while you sew.